03.30.19 21:23 Account Transfer -60.00 Sent Payment: 60.00 USD to account U8005321 from U1294xxx. Batch: 253299128. Memo: Shopping Cart Payment. 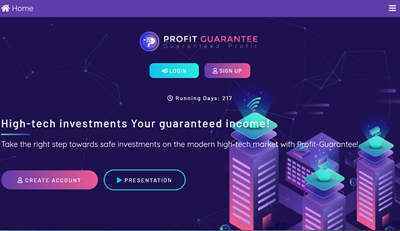 Deposit to Profit-Guarantee.com User allhyips. 31.03.19 15:49;Account;Receive;Received Payment 10.5 USD from account U8005321 to account U1294000. Batch: 253375609. Memo: API Payment. Withdraw to allhyips from Profit-Guarantee.com. 01.04.19 13:28;Account;Receive;Received Payment 1.8 USD from account U8005321 to account U1294000. Batch: 253585987. Memo: API Payment. Withdraw to allhyips from Profit-Guarantee.com. 03.04.19 17:45;Account;Receive;Received Payment 1.8 USD from account U8005321 to account U1294000. Batch: 254208540. Memo: API Payment. Withdraw to allhyips from Profit-Guarantee.com. 02.04.19 18:20;Account;Receive;Received Payment 1.8 USD from account U8005321 to account U1294000. Batch: 254046005. Memo: API Payment. Withdraw to allhyips from Profit-Guarantee.com. 04.04.19 18:32;Account;Receive;Received Payment 1.8 USD from account U8005321 to account U1294000. Batch: 254377707. Memo: API Payment. Withdraw to allhyips from Profit-Guarantee.com. 06.04.19 07:54;Account;Receive;Received Payment 1.8 USD from account U8005321 to account U1294000. Batch: 254569046. Memo: API Payment. Withdraw to allhyips from Profit-Guarantee.com. 05.04.19 11:46;Account;Receive;Received Payment 1.8 USD from account U8005321 to account U1294000. Batch: 254456438. Memo: API Payment. Withdraw to allhyips from Profit-Guarantee.com. 07.04.19 13:49;Account;Receive;Received Payment 1.8 USD from account U8005321 to account U1294000. Batch: 254714599. Memo: API Payment. Withdraw to allhyips from Profit-Guarantee.com. 08.04.19 19:59;Account;Receive;Received Payment 1.8 USD from account U8005321 to account U1294000. Batch: 254917500. Memo: API Payment. Withdraw to allhyips from Profit-Guarantee.com. 10.04.19 17:03;Account;Receive;Received Payment 1.8 USD from account U8005321 to account U1294000. Batch: 255224306. Memo: API Payment. Withdraw to allhyips from Profit-Guarantee.com. 09.04.19 22:25;Account;Receive;Received Payment 1.8 USD from account U8005321 to account U1294000. Batch: 255094892. Memo: API Payment. Withdraw to allhyips from Profit-Guarantee.com. 11.04.19 04:03;Account;Receive;Received Payment 1.8 USD from account U8005321 to account U1294000. Batch: 255274648. Memo: API Payment. Withdraw to allhyips from Profit-Guarantee.com. 2.04.19 09:02;Account;Receive;Received Payment 1.8 USD from account U8005321 to account U1294000. Batch: 255467760. Memo: API Payment. Withdraw to allhyips from Profit-Guarantee.com. 14.04.19 03:24;Account;Receive;Received Payment 1.8 USD from account U8005321 to account U1294000. Batch: 255718151. Memo: API Payment. Withdraw to allhyips from Profit-Guarantee.com. 16.04.19 03:17;Account;Receive;Received Payment 1.8 USD from account U8005321 to account U1294000. Batch: 256003943. Memo: API Payment. Withdraw to allhyips from Profit-Guarantee.com. 15.04.19 05:15;Account;Receive;Received Payment 1.8 USD from account U8005321 to account U1294000. Batch: 255843671. Memo: API Payment. Withdraw to allhyips from Profit-Guarantee.com. 17.04.19 11:43;Account;Receive;Received Payment 1.8 USD from account U8005321 to account U1294000. Batch: 256232919. Memo: API Payment. Withdraw to allhyips from Profit-Guarantee.com.